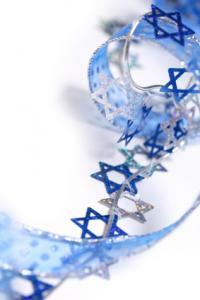 Hanukkah is a time to gather together and celebrate with family and close friends. Learn about the traditions, foods and games that are part of this eight-day festival and build your party around them. Hanukkah is a Jewish festival that extends for eight days and commemorates the history of suppression in the Jewish religion and the rededication of the Holy Temple of Jerusalem. During that original rededication, a miracle occurred. When Judah the Maccabee wanted to relight the Temple menorah, there was only enough oil to keep it lit for one night. Miraculously, the menorah remained lit for eight days since, by tradition, the lights are never blown out. Instead, they are allowed to burn until they go out on their own. There are certain traditions that are an integral part to every Hanukkah celebration. Although you can choose to skip decorating altogether, you can add to the festive feeling of your celebration by adding touches of blue, silver and white to reflect the colors of the Israeli flag. The one essential of any Hanukkah celebration is the menorah used in a special candle lighting ceremony. The lighting of the menorah, a type of candelabra which holds nine candles, begins on the first night of Hanukkah. 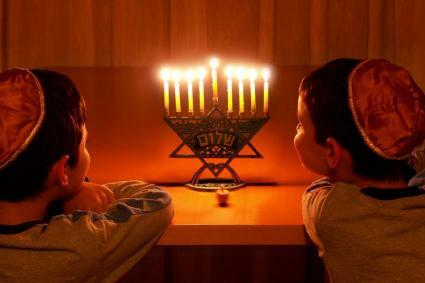 One candle is added to the menorah and lit each night, beginning on the right side on the first night, switching to the left on the second night, and then alternating from right to left on successive nights. The last night of Hanukkah, all of the candles, including the shamus candle in the center, are lit. The shamus candle is of a different height from the other candles, making it easy to differentiate during the ceremony. Since the menorah candles are never blown out, make sure to keep watch until they are out to avoid a fire hazard. There are three traditional blessings prayed during the candle lighting/kindling ceremony. On the first night, all three blessings are recited, but only the first two blessings are recited on the following nights. Hear each blessing recited in its entirety at Chabad.org. After the candle ceremony, many celebrants like to sing the Ma'oz Tzur, the traditional Hanukkah song. The song is about salvation, persecution and praise to God for helping the Jewish people to survive. Listen to a recording of the song and read the lyrics. After dinner, it's time to exchage gifts. One gift is typically given per person on each night of the celenration. These gifts do not have to be expensive, but they really should be meaningful to the person who receives them. 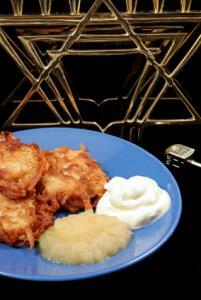 It's a long-standing tradition to serve latkes during the Hanukkah celebration. Latkes are little potato fritters or pancakes that are pan-fried in oil and served with applesauce and sour cream as condiments. In a bowl, combine the grated potatoes and onion and stir together. Next, work in the matzo meal, salt and pepper. Heat the oil in a medium size frying pan, and drop in the latke batter one tablespoon at a time. Fry until golden brown on one side and then turn and fry the other side. Drain the latkes on a paper towel to absorb excess oil, and serve them on a platter with applesauce and sour cream on the side. 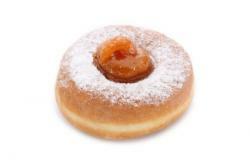 Sufganiyots are jelly donuts that are fried in oil. This excellent series of videos show how to make these special Hanukkah treats for your gathering. Tradtional games provide entertainment for youngsters at your party. Dreidel: Spinning the dreidel is a favorite Hanukkah activity for adults and children alike. The dreidel traditionally involves putting money into and taking money out of a central pot, but if you don't want to play with real money, you can always substitute chocolate coins (chocolate gelt) or other pieces of candy. 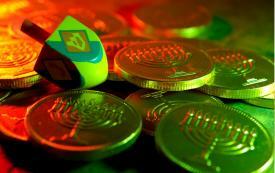 The dreidel contains a flat top and is marked with four Hebrew letters. Depending on the letter that is showing after the dreidel is spun and comes to a stop, players may or may not receive a part or all of the pot. Many families choose to play until one person has won the entire pot. At that time, the winnings are typically divided equally among all of the players. Musical chairs: Musical chairs is another Hanukkah party favorite. For an extra twist, play Klezmer music or traditional Jewish folk music. In all the bustle of planning and preparation, the most important thing is to remember the true reason for the celebration. Plan a wonderful get together, and keep family, friends and faith the real focus of the evening.